Wow! I’m really rusty! It’s been so long since I’ve posted. But, I thought I’d give it a shot today. Just like with everyone else….real life takes over and the blog comes in second! I had some surgery and put my camera on the shelf for a bit. Then we were blessed with our first grandchild! We took several trips too. It’s been quite a summer! I’m not sure I can keep up with two blogs, taking classes and community work. Darkness cannot drive out darkness: only light can do that. Hate cannot drive out hate: only love can do that. Nikon D300, Lens: Sigma 18-250, ISO-200, f/6.3, PSE 11, Kim Klassen’s Paper Stained Texture on Multiply @78%. 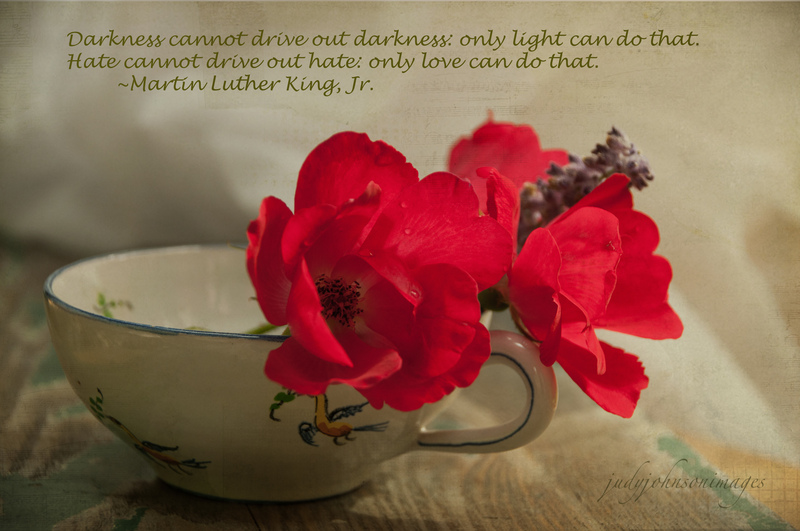 This entry was tagged antique, Kim Klassen, light, Martin Luther King, Nikon D300, photography, quote, red, rose, russian sage, tea cup, texture, Texture Tuesday. Wow, Andy! That was fast! Thank you so much! What a great welcome! I love that quote too! Great shot Judy. Congratulations and welcome back grandma. Glad your on the mend. Hi Jim! Thank you very much! I’ve missed everyone, and I’m not sure how often I’ll be on here, but it’s very nice hearing from blogger friends! Thanks again for your kind words! What a wonderful photo and quote – I love it! Hi Rosie! Thank you for your comments! Glad you enjoyed them! Welcome back – I didn’t even realize you were still on here anymore! Congratulations on your grandchild! I’m really happy for you. Hi Sheila~ I haven’t been here! And I’m not sure when I’ll be around. But it’s certainly fun (and a boost!) to hear from my blogging friends, when I do come back!! Thanks for your lovely comments! Hi Earl…Thank you very much! Those flowers are lovely and I love this still life Judy ! A new baby in the family, what a joy, congratulations ! Thank you, Jocelyne! I posted and then went away for a week, but I’m back and loving your comments. Thanks so much!